Well, we are one day closer to Friday. Happy Tuesday! Today, I have one of my favorite ladies for today’s Pretty in Pink guest- Deeyn Rhodes of Nannie Inez. Now, Deeyn is one freaking cool lady. She is one of the classiest gals I know, and she just exudes sophistication. Moving here from NYC, she is now the owner and purveyor of the coolest design & home decor shop in Austin- Nannie Inez. She is frequently traveling the world, finding original and exceptional things to bring back to us. Her store is such a gem, and should definitely be on your list of places to hit if you’re visiting, or if you’re doing birthday/ anniversary/ holiday shopping (hint hint Justin). But cool things alone do not a shop make. Aside from having beautiful things in her shop, Deeyn makes an effort to connect to her community. She frequently invites other makers to come in and host workshops. I myself have done a perfume workshop at the shop and it was delightful. On a personal note, she is really special. You know when you meet someone and they immediately put you at complete ease, so much so, that you feel comfortable talking freely and completely? She has that quality. And what an amazing quality to have. Upon meeting her, I was so impressed by her style and sophistication, but even more impressed by her warmth and ability to connect. She is so easy to talk to, and while I rarely tell people of my far-fetched long-term dreams, I have shared these with Deeyn. Another (and yes there are many) of the exceptional things I have noticed about Deeyn is the care and time she takes with people. While I am guilty of writing quick and truncated emails, often without greeting or salutation, she writes thoughtful and invested emails. It’s no coincidence why people love her, and I’m no exception. Thanks my beautiful friend for spending time with us, and for sharing some of your favorite items in the shop. 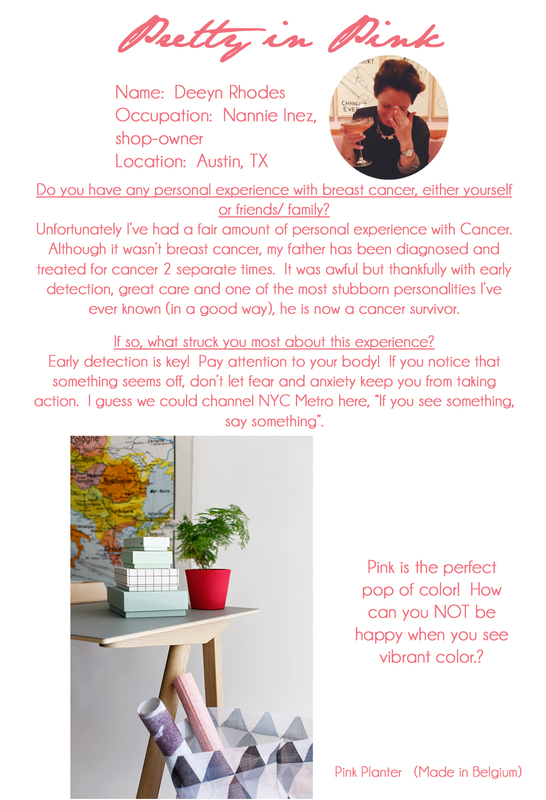 Thanks again Deeyn for sharing your dad’s story with us, and for tuning us in to what’s hot in pink in your shop.